The waves are coming up next Wednesday and Friday and look for days after that. The wind will be returning after the weekend when a strong will move in the right position to provide us with our trade winds. 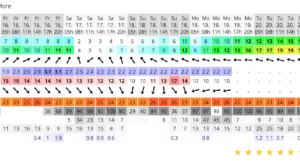 Although, right now the wind will be very South East, it looks promising after a almost 2 weeks of nows but great (sup)surfing.